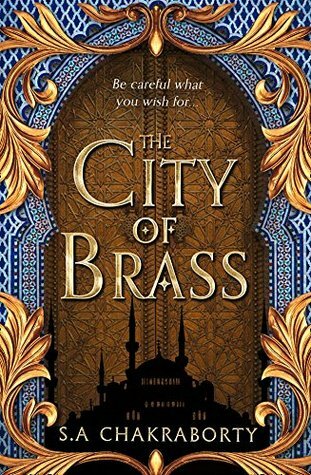 For a while, it seemed like everyone I followed on Twitter was talking about The City of Brass, but all I really knew about it was that it had a gorgeous cover. Having heard it discussed, I requested it pretty quickly when I saw it on NetGalley — peer pressure is real, especially when it comes to books — but then I procrastinated on reading it. The thing is, it’s long. It was a big commitment. Sure, people were raving about it, but hyped books are nearly always a disappointment, and if it was as good as they said, then I wanted to wait until I had the time to actually commit to it. Well, I found myself stuck in Stansted Airport waiting for a delayed flight to Shannon, and I figured I had the time and might as well give it a go. To my surprise, I got extremely invested in it. It took me a little while to get into the story. This was partly because I was unfamiliar with a lot of the terminology, being white and British and horribly ignorant of cultures I haven’t personally experienced, though I didn’t feel it was too difficult to understand and I picked up most terms fairly quickly. Mostly, my lukewarm initial reaction was because of the main issue I had with the book: I didn’t really like the writing style. I’m not sure why, but something about it kept bothering me. A couple of times I wondered if it would have worked better in 1st person (maintaining the switching POVs), rather than in 3rd, but I don’t know if that would have helped. The prose just didn’t entirely convince me. However, that aside, once I got into the story I really got into. Despite reading it in an airport, and then on a plane, and then in my accommodation at 1am when I finally arrived, and then the next day in a new place — i.e., in a fairly disjointed manner with lots of other things to distract me — I stayed invested in and engaged with the plot. When I put it down, I found myself thinking about the plot and wondering what would happen next. I also enjoyed the characters, and the way it was difficult to tell who was meant to be “good”. Seeing things from two different perspectives meant that certain characters (mostly Dara) were portrayed in two very different lights: either as a trustworthy, if worryingly powerful, rescuer, or as a feared and hated monster of legend. It was never clear which side you were supposed to be on, and who was telling the “truth”; the resulting shades of grey made for a much more interesting story. Despite being a hefty book (I assume; I read it on Kindle but it seemed pretty long), I still found myself wanting more at the end. I needed to know what would happen, and I was particularly eager to see more of certain characters, even if it’s not entirely clear whether that will be possible in the sequels (without giving away any spoilers…!). On the whole, then, I really enjoyed this, particularly the plot and the characters. But the writing style came close to putting me off in places. I wonder if, because this is the author’s debut novel, that will become less noticeable in later books. It would probably be a 3.5* read, but since I try and make a policy of not using half stars, I’m going to round it up — mostly because anything that can keep me engaged when I’m anxious and in an airport is definitely worth reading. Great review for a great book!! !